This past Friday, several pugilists were on display and the action was very fast-paced and competitive. Joseph “El Bandito” Macedo is a familiar face to Hustle Boss viewers, and he received some great work from Shaun Ross. A native of Uganda, Ross applied great pressure and Macedo in return had to adjust and counter with his attack. 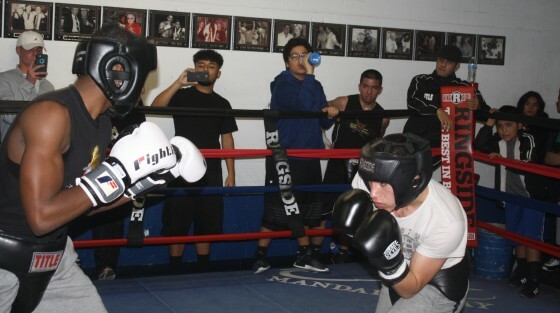 Friday marked my first time checking out Armenian amateur prospect Erik Barsegyan in action, as he went some rounds with both Javier Medrano and Santiago Perez. All three prospects are worth keeping an eye on and the action didn’t let up in any of the four rounds I witnessed. Never a stranger to First Friday Sparring sessions, Jeremy “J Flash” Nichols got in some entertaining rounds with southpaw prospect Za-Quan Peterkin. Nichols started working during the series when he was an amateur and he is now 7-0-1 with 2 knockouts as a professional. Peterkin will also be making his pro debut in the very near future. To close out the show, national amateur champion Alex “ATG” Thiel put in some good work with veteran Azamat Umarzoda (2-11-2, 1 KO), who is much tougher and dangerous than his record indicates. Thiel started fast during the sparring and didn’t let up, hammering Umarzoda with shots from all angles as his durable foe from Tajikistan kept up the pressure. As the last round closed, Thiel continued to throw until the final bell sounded. All in all, this first edition of exhibition sparring at Johnny Tocco’s set a great tone on what to expect from this series for the rest of the year. Every first Friday of the month, amateur and professional prospects in the Vegas area can stop by to put their skills on display. So far, their have been some great matchups and I expect this continue in 2017. Check below for a closer look at the action, from both this past Friday as well as past shows, and stay tuned for more sparring at Tocco’s. Back and forth female sparring at Tocco’s – #1 ranked Yarisel Ramirez vs. Laura I.